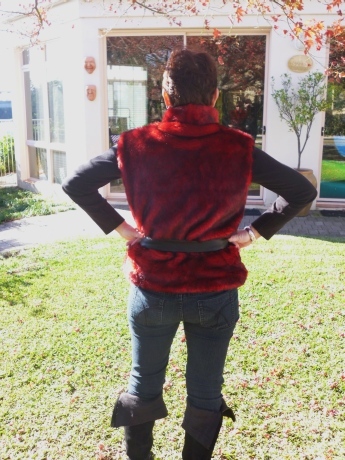 I found this great fur remnant recently and thought it would make a lovely warm vest. The red and black is a lovely combination. the lining was some satin that I had initially bought to line another jacket, but I have lost enthusiasm for that, I will rethink it. I decided that this was perfect for my fur vest. the pattern does not have much shape and as I have had to join the fur to get the length it is possibly not as sleek as it might otherwise be. Saying this though I still like it! It’s colorful,fun and warm. The pattern calls for the vest to have a belt, I am not sure I like the belt on it but I am using one I had. I didn’t want to make one. Sewing the fur is a challenge bigger stitches are required and slower speed because of the bulk. It wasn’t too hard ,another new experience. For future reference I now know that when cutting fur fabric cut the base fabric not the fur so you don’t get distinctive lines in the garment.